that old chestnut! . . .
roasted chestnuts worth their weight in gold . . . I don’t know if you have ever had roast chestnut dressing with Thanksgiving turkey, but I’ve been making it for over forty years. During that time, I have wrestled with probably a ton of these nuts, going from store to store to find ones that aren’t dried out or rotten inside. That is, if you can even get the peel off without the brown crusty skin sticking to the nutmeat so it’s not usable unless you scrape it out with a spoon. None of the roasting temperatures work including Martha Stewart’s recipe: slicing into the shell whether it’s an “X” or making a slit in the center to let steam out of the chestnut and roasting them in a hot oven for varying timetables from 20 minutes to an hour (!) just don’t work. They haven’t for me for years, which is why I start vetting chestnuts that I can find shortly after Halloween in order to harvest a small cache of tender nutmeats to use in the herb Pepperidge Farm crumb stuffing that I make double quantities of and serve with homemade turkey stock/gravy on top. Some years, the turkey itself seems peripheral to the roast chestnut stuffing and gravy which people love to eat the most. This year, I had already gone through two sets of chestnuts purchased at the Stop and Shop and at Market Basket. The MB ones were peelable but were tough and tasteless out of the shell. I stuck them in a ziploc bag in the freezer anyhow, thinking I might be able to boil them later to make them more tender if I didn’t have anything else. The Stop and Shop group stuck to their brown fuzzy inner skins and I had only about half a cup of usable nutmeats after roasting and shelling them. That’s twelve dollars down the drain already. I waited to see if Trader Joe’s had chestnuts for sale because I remember last year that theirs were the best. Yesterday, I called TJ and they had just gotten their chestnuts in. I went down and bought two packs of Italian chestnuts, that brand solely available through Trader Joe’s. In the meantime, I had gone on Youtube to see if people had success harvesting roasted chestnuts and what their methods were. I came across one that microwaved theirs for three minutes after rinsing in cold water first after slitting the shells. Then, I came upon one that made the most sense from a physics/chemistry perspective which also had a video showing roasted chestnuts popping out of their shells with hardly any human intervention. This method required cutting down each side of the chestnut with a sharp knife. 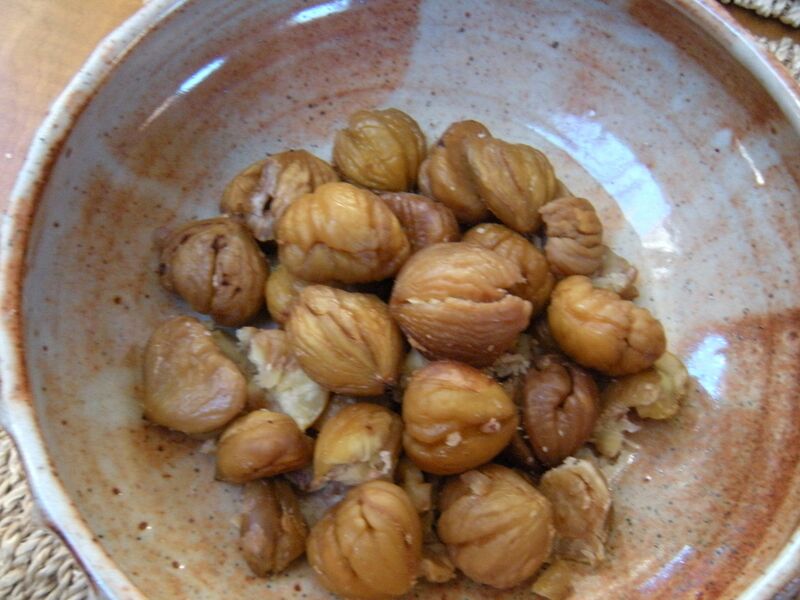 I used a serrated paring knife–and cut them on a layer of soft kitchen towel, otherwise the nuts slip around on a cutting board and you could injure yourself. 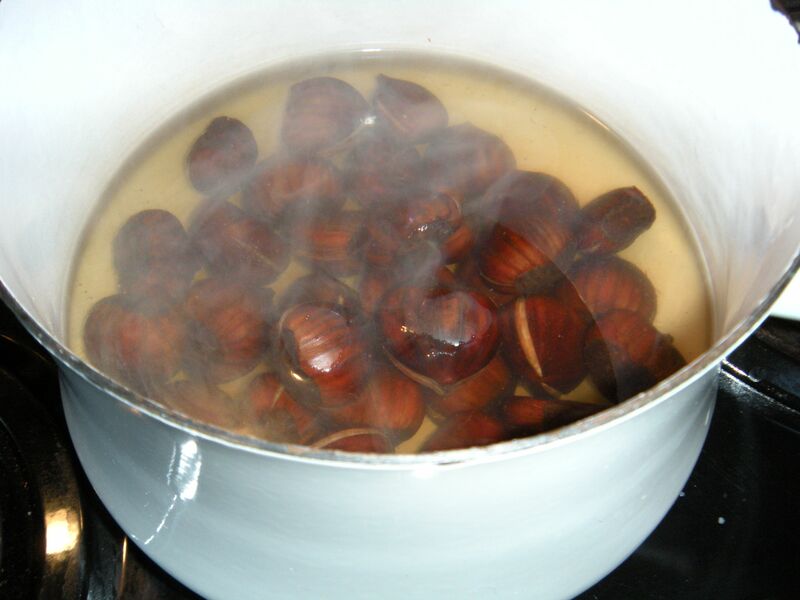 Having sliced the chestnut down either side, then placed the chestnuts into a large pot of cold water and which I brought to a rolling boil. Let the chestnuts sit in the pot off the heat for twenty minutes. Already, a couple of them had opened up to show a nut inside free of the brown skin, a very good sign. The final step of this method was to then roast them in a preheated oven set at 400 degrees for 20-35 minutes (start checking them after 20 minutes,) placing the still wet chestnuts on a cookie sheet. 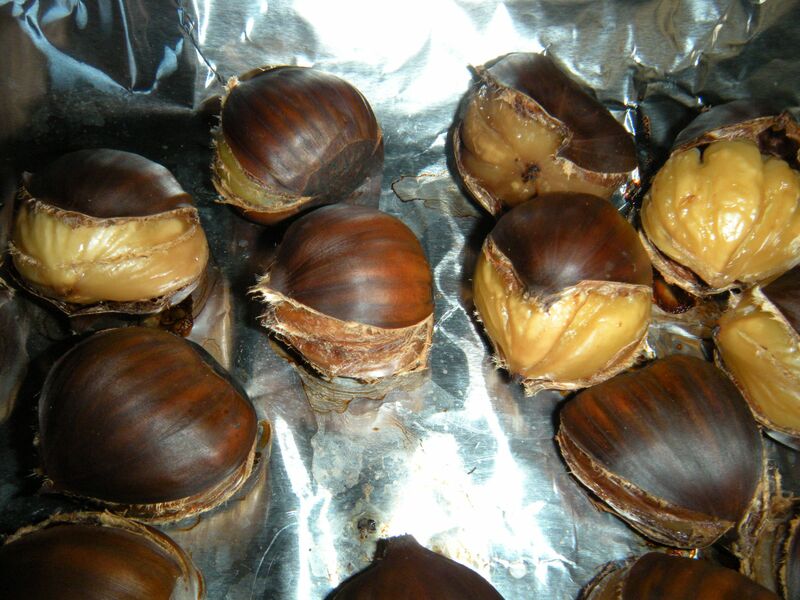 The combination of a) slitting the chestnuts open (long cuts all the way down each side) sufficient for water to enter and permeate the shell, b) parboiling them so that hot water entered the slits inside the chestnuts to loosen the brown skin from the nut; and then c) baking the wet chestnuts in a very hot oven for the final actual roasting step provided extra insurance that the whole thing pops out of the shell at the end of the process. 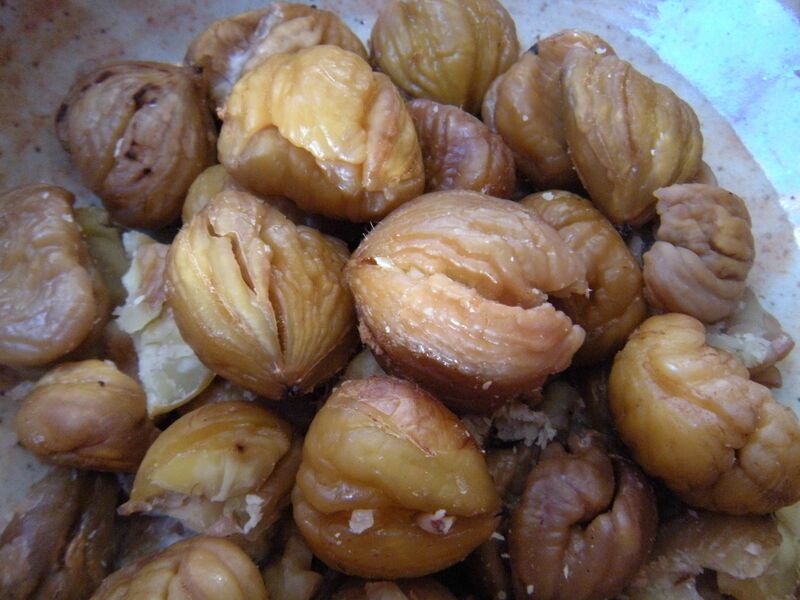 Because we are so fond of roasted chestnuts to eat, as well as to have in our turkey dressing, this three-part invention for harvesting chestnuts is a Godsend. It also requires, however, that you buy good chestnuts to begin with. I’ve found that loose ones in grocery stores a week before Thanksgiving are often dried out and have rotten parts in more than half of the ones that you buy. Trader Joe’s chestnuts from Italy are the ONLY ones that I have found that are not that way. So, if you want to save a lot of money ($5.99 a pound!) perhaps you’d like to try theirs. 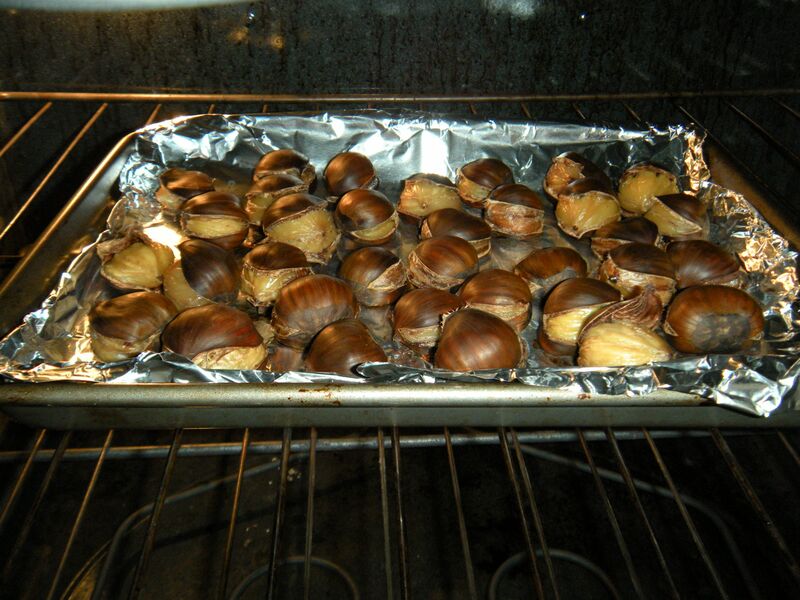 split open chestnuts roasting in the oven. . . If it works, I’m happy that we’ll be able to eat chestnuts forevermore instead of giving up on them, which is where I was after the second batch of unsuccessful batch last week–and together with other winter fruit like tiny juicy clementines & persimmons you have to buy to ripen on the windowsill that make the Fall a wonderful season of Thanksgiving that keeps on going through the Winter holidays. freshly peeled . . .